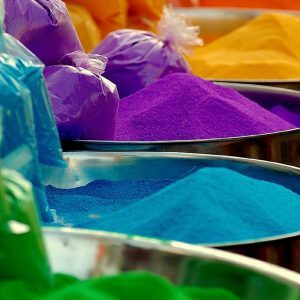 Teach Your Child About Colors with These Fun Projects! Colors are one of my favorite lessons to teach my kiddos. While I’m teaching them each color, I love to show them the magic of mixing colors as well. I believe one of the best ways to learn is to do! So I put together a list of great color projects and experiments easy to pull together at home! All the projects are quick, affordable, and super fun! An oldie but goodies project! Kiddos learn turning little squares of paper into beautiful artwork. 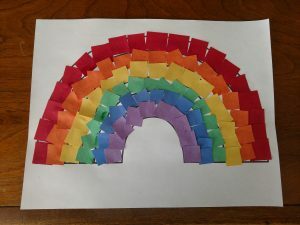 This project gets their fine motor in action while teaching kids about the colors and color order of a rainbow. Pair this is with a good rainbow book, and the lesson is solid! Give this project a little twist and create edible material. Used colored popcorn to give this project a more tactile and sensory experience. Check out our Colored Popcorn Recipe for vibrant and yummy materials! This is an especially fun project to do when teaching your kids about primary colors and color mixing. 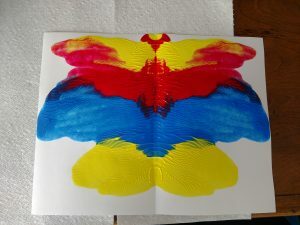 Using primary color paint, your kiddos can see the color mixing magic when they reveal the look of their butterfly. I let the kids identify the new colors they see and reiterate the two primary colors that mix together to make that color. For example, I ask, “Do you see any new colors that weren’t there before?” My students will say, “Yes, orange!” I will respond, “Great! Do you remember what two colors we put in this spot?” My student go, “Yes! Red and yellow!” I concluded, “So when we mix red and yellow together, we get….” Students respond, “Orange!” Then I move on to the next color. I outline this technique in the Snowflakes (Tie Dyed) project. I also use this project to teach my students about color mixing. Only using primary colors, I have my student color three adjacent areas. Then use the coffee filter and spray bottle technique described in the project to create the color mixing effect. The filters can then be used to create a tree project like in the Look at those Leaves! Tree project. Experiments are always a great way to supplement a lesson plan. Involve your child by asking questions and having them document their discoveries. This help drive home the concepts you are teaching them as well as gets them to look beyond the surface of your lessons. This quick experiment is fun to do and watch. It uses household items and is easy to do and clean up! In a shallow container (I use old sour cream or butter lids), pour enough milk to cover the bottom. Add a few drops of red, blue, and yellow food coloring in different locations of the lid. Try not to over saturate the milk with food coloring. Over saturation will make the results brown or black. When you are ready to see the magic, add one drop of liquid dish soap to the lid. Watch the magic! To put a spin on this experiment, prepare three lids. Only put 2 primary colors of food coloring in the milk for each lid: red and blue, red and yellow, yellow and blue. Then add the soap and see what happens! Follow the instructions to create your own homemade book here. Label each page with a color word. Give your child an old magazine that they can cut up. 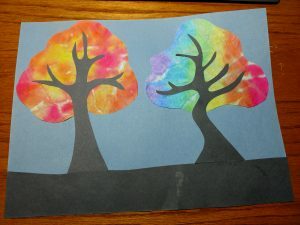 Have your child cut out pictures with each color and glue it to the pages. If you don’t have an old magazine, shopping advertisements work too! You can also have your child draw pictures of things that match each other. Give these activities a try to help your child learn their colors! Keep a look out for more projects coming soon! P.S. For more information on how you can become a part of our LGP Community, click here!